A: Strong reaction of IDH1 mutation specific antibody clone H09 in tumor center of anaplastic oligoastrocytoma. 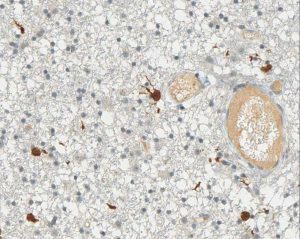 B: Infiltration zone of anaplastic astrocytoma with specific labelling of infiltrating glioma cells by antibody clone H09. 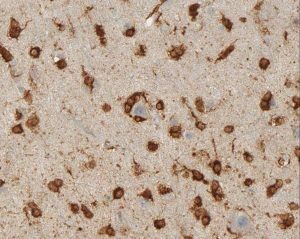 C: Identification of single tumor cells in white matter distant from tumor center with antibody clone H09. 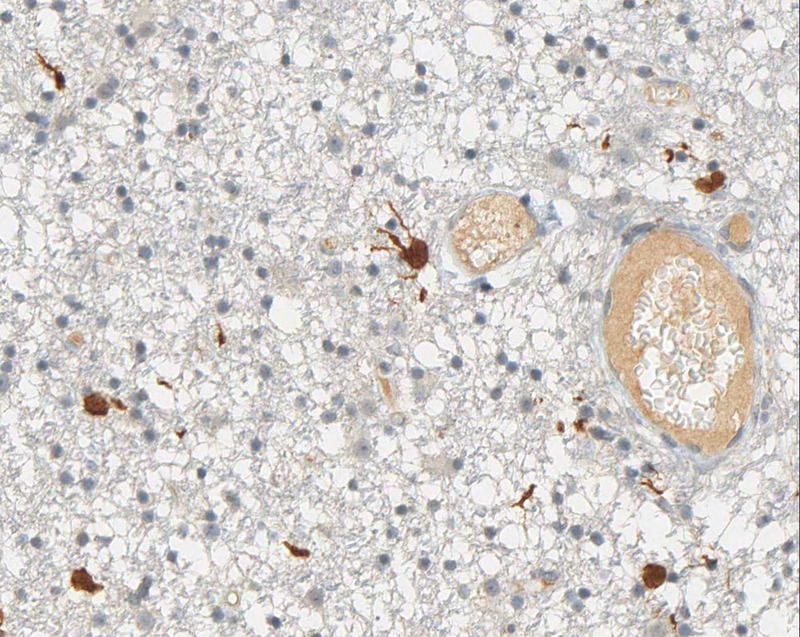 D: Cortex infiltrated by oligodendroglioma with specific labelling of tumor cells by antibody clone H09. 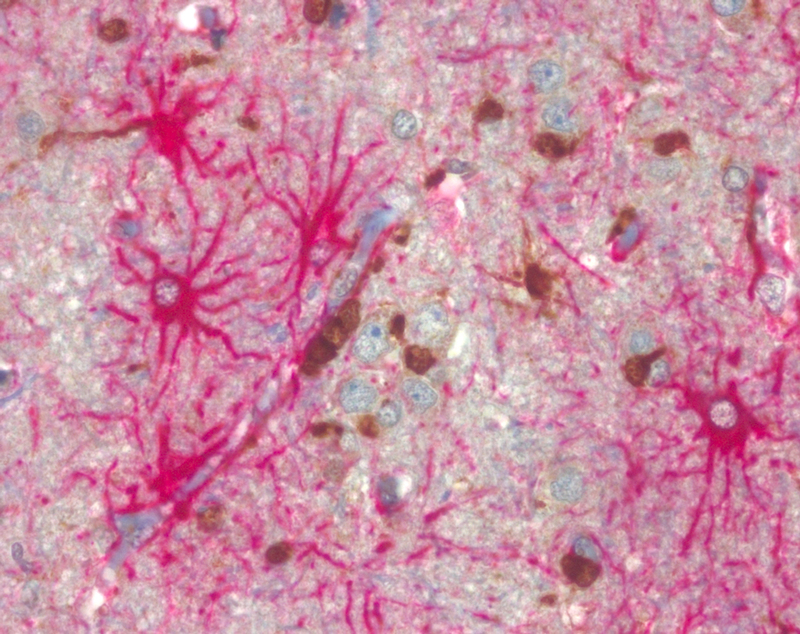 E: Double staining of GFAP (glial fibrillary acidic protein, red) and clone H09 (brown) of oligodendroglioma infiltration zone demonstrating specific labelling of tumor cells but not of GFAP positive reactive astrocytes. 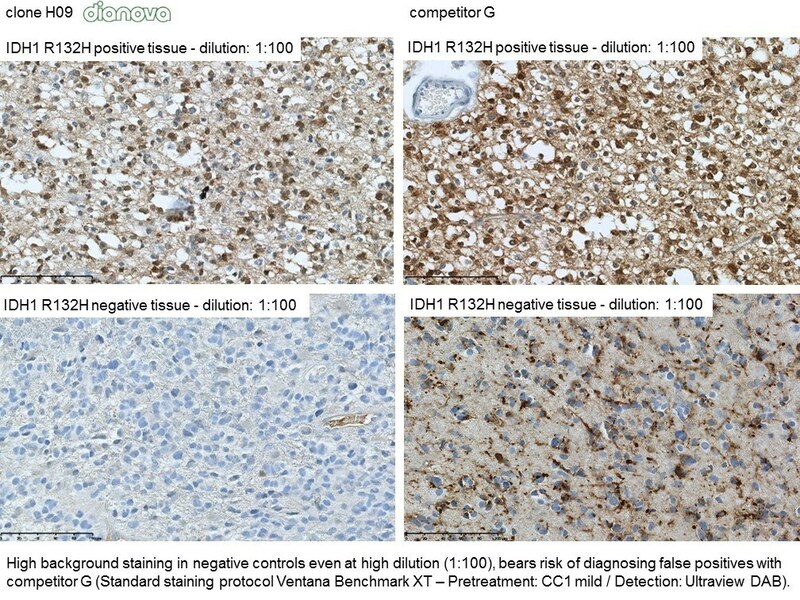 F: Strong reaction of antibody clone H09 with IDH1 R132H mutated diffuse astrocytoma (left) but not with wild type tumor (right). 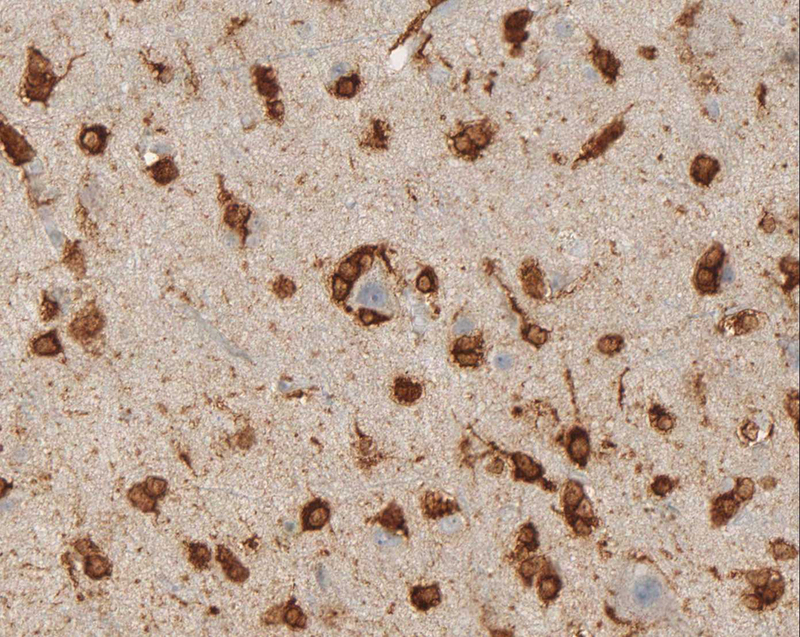 Antibody clone H09 reacts specifically with the isocitrate dehydrogenase 1 (IDH1) R132H point mutation in tissue sections from formalin-fixed brain tumor. 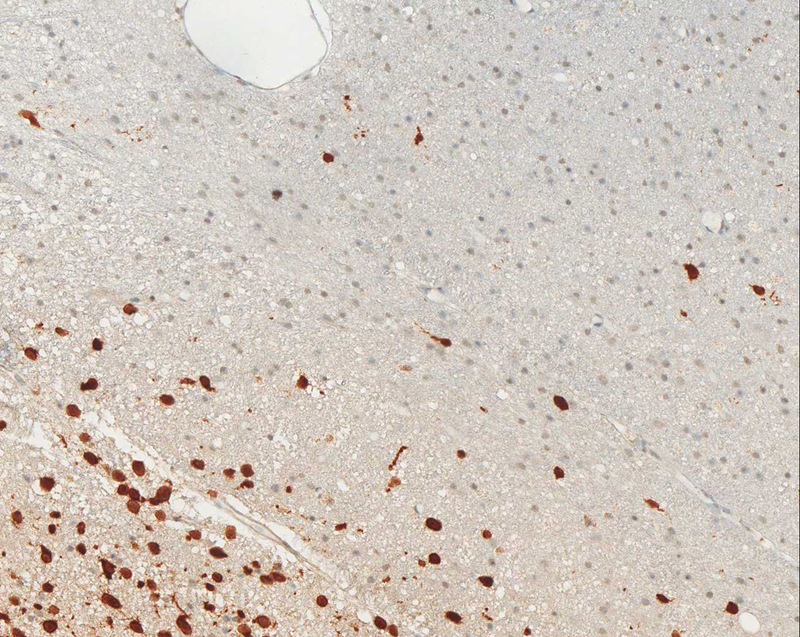 Heterozygous point mutations of IDH1 codon 132 are frequent in World Health Organization (WHO) grade II and III gliomas. IDH1 R132H mutations occur in approximately 70% of astrocytomas and oligodendroglial tumors. 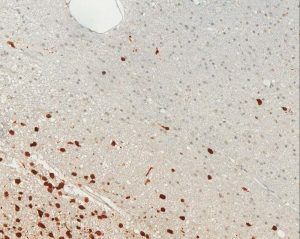 The high frequency and distribution of the IDH1 R132H mutation among specific brain tumor entities allow the highly sensitive and specific discrimination of various tumors by immunohistochemistry, such as anaplastic astrocytoma from primary glioblastoma or diffuse astrocytoma WHO grade II from pilocytic astrocytoma or ependymoma. 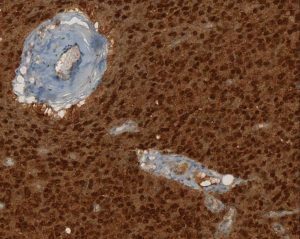 Noteworthy is the discrimination of the infiltrating edge of tumors with IDH1 mutation from reactive gliosis.